A sound engineer, also called an audio engineer, audio technician, audio technologist or sound technician, is a specialist in a skilled trade that deals with the use of machinery and equipment for the capturing and processing, recording, mixing and reproduction of sounds. 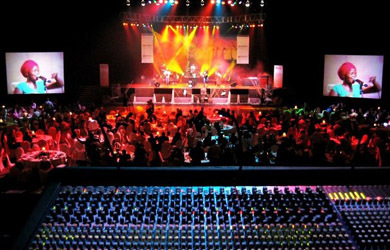 Sound engineering concerns the creative and practical aspects of sounds and music.’ At Golden Circle our sound engineers have successfully run with some of the most varied and challenging sound and music events in South Africa and abroad. The company’s engineering skill and experience spans most genres of music and arts including full Philharmonic Orchestras, Theatre Productions, Local and International Bands as well as current and specific knowledge of electronic music production and DJ requirements. Golden Circle provides specialised crew for the Sound Design, Installation and System engineering for music clubs, concert halls and venues of all shapes and sizes to more complex and large scale events such as festivals, International concerts, Theatre productions and Corporate events.